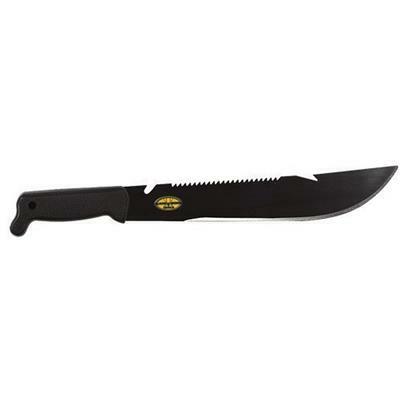 High carbon steel machete with injection molded, virtually unbreakable handle. The multi-functional Black oxide blade has a spear point for self defense, a saw edge on the spine and a sharp edge on the impact side. This baby is built for work and abuse, big enough to take a whack out of something and fit in your backpack. A force to be reckoned with! 12" blade, 18" overall. Weighs .68 lbs.